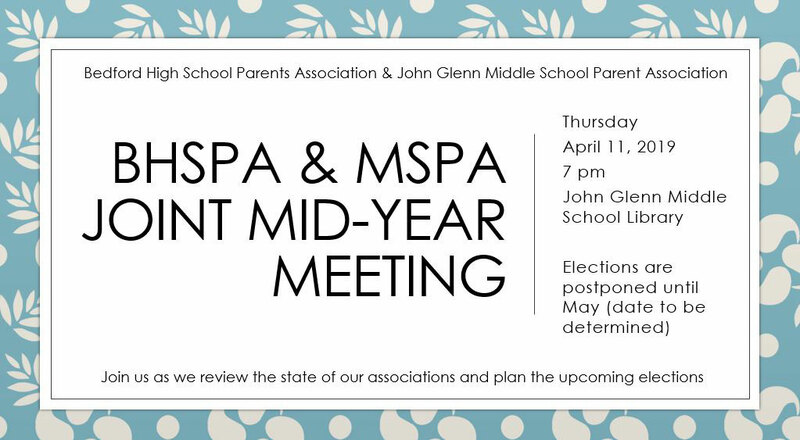 The BHSPA will hold its annual mid-year meeting jointly with the Middle School Parent Association (MSPA) at 7 pm in the JGMS LIBRARY located at 99 McMahon Rd., Bedford. It's a joint meeting because eighth grade parents and guardians will become BHSPA members shortly and are permitted by our bylaws to vote and even run in our May election. This is true for Hanscom Middle School parents too! On 4/11, we will review of the state of each association and plan for the upcoming elections. Information will be given about the various board positions and committees. We welcome your involvement! If you are interested in any of the open positions, please send an email to the applicable PTO: the BHSPA is at bhsbucsparents@gmail.com and the MSPA is at jgmsparents@gmail.com. SPECIFIC TO THE BHSPA: Click here to see a sampling of things we have done recently. Check out this website for more information about our school. For the upcoming school year, the following BHSPA positions are open: Co-President, Co-Vice President, Co-Chair for Hospitality, and all Committees need more members. Contact us at bhsbucsparents@gmail.com to get more information and/or throw your name in the hat to run for a position.